Derry City assistant boss, Kevin Deery praised the job done by Kenny Shiels in his second season at the club. DERRY CITY assistant manager, Kevin Deery has praised Kenny Shiels for steering the club through one its most difficult times. The former City boss was sacked after a dismal league campaign which saw the team miss out on European qualification and finish in seventh place. However, Deery, who returns to the Brandywell as new Derry City manager, Declan Devine's No. 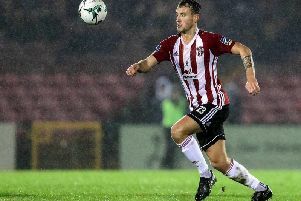 2, insists Shiels deserves 'tremendous credit' for how he managed the club following Ryan McBride's tragic death in March 2017. "To be fair to Kenny, he deserves credit as well. He had two tremendous years and I've never seen a situation handled as well by a manager in terms of when we lost our good friend Ryan. "He deserves tremendous credit for that. That's one of the best bits of management I've seen. "To keep the club going so strong and getting into Europe he deserves tremendous credit for that." The Derry City Board of Directors felt it was time for a change and replaced Shiels with Devine and his all-Derry management team after the 2018 season ended with a dismal run of six defeats from seven. "It was a difficult season this year. There was a run of 10 or 11 games and after that it became a bit complacent. You ask to ask if people were there for the right reasons, we don't know." Last season is very much in the past for Deery and the new management team and as they look to rebuild the team ahead of the 2019 campaign, the former City skipper is on the look-out for players who will wear the Candy Stripes with pride. "What I can guarantee is that everyone we bring through the door this time will understand what we feel the value of our club is. "It is our club, we're Derry men and we won't be suffered for fools by people who think they can come in and not buy into what our great club is about. "What I can guarantee is we're concentrating on getting a team that reflects the graft and endeavour of the people of Derry - that's what we're trying to replicate on the playing side of things. "If you have 14 men on a Friday night giving everything that's all you can ask. We're digging deep to get players and that's the endless effort we're putting in at the minute. We're not foolish thinking we can flood the team with Derry lads but we're trying to get people to relocate to the city - it's a lovely city to live in and it'll reward you."